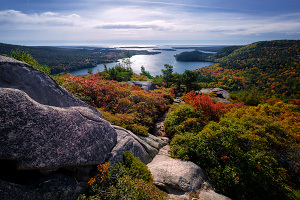 The forested trail quickly makes its ascent up the west face of Acadia Mountain, with a few sections of relatively steep rock formations that require a bit of scrambling. Soon enough, the territory levels out and you will be walking along the beautiful granite formations towards the summit. The views near the summit marker are spectacular. Continue east along the ridgeline towards a second summit point for even more outstanding views. The trail then turns south and makes a steeper descent through the granite formations; take care in this section as several obstacles will require a bit of scrambling to get down. Once back in the forested valley, the trail crosses the lovely Man o' War Brook and an optional viewpoint spur trail takes you to the spot where the brook flows into the ocean. To complete the loop of this hike, take the Man o' War truck road (closed to vehicles) west back to the parking area. 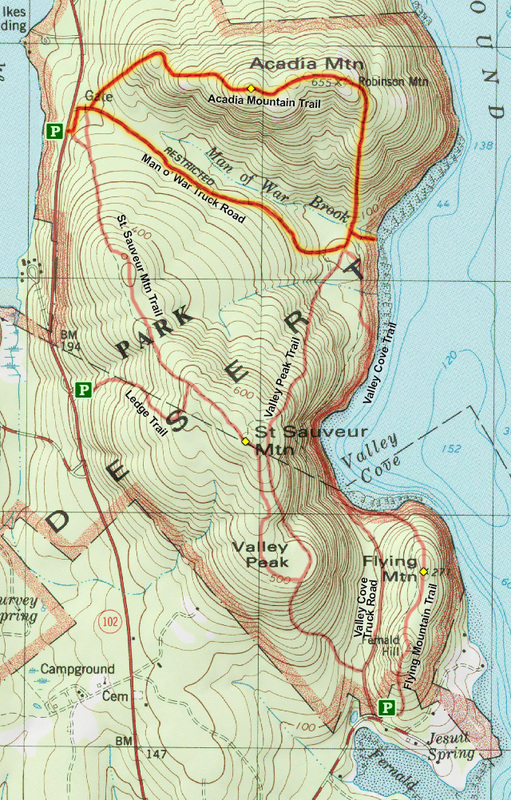 Note: For longer loop hike options, you could continue along the Valley Peak Trail to the summit of St Sauveur Mountain or take the Flying Mountain Trail to Flying Mountain returning via St. Sauveur Mountain. Acadia Mountain is a great little peak! While it's not the tallest mountain or the most dramatic trail, the scenery is sublime. 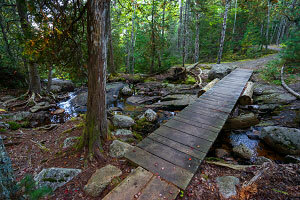 Consider tying this in with a loop hike up St. Sauveur Mountain for a longer adventure.